Ever wanted to quickly see what software is installed on a remote machine without having to run some network auditing software or connect to the machine and look in Add/Remove Programs? If so then this little application I’ve written should be quite useful for you (and if not… download it anyway, it might come in handy in the future!). 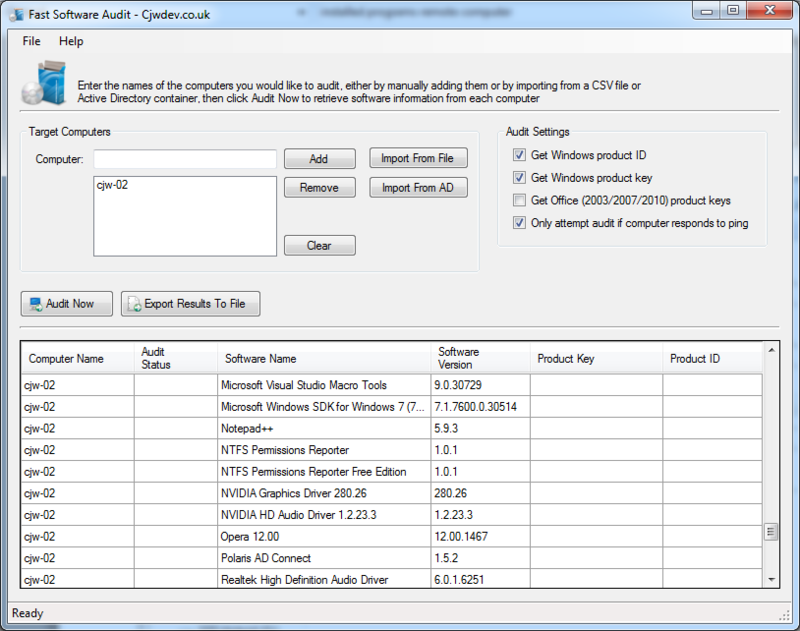 As well as just viewing the installed applications on a remote computer, you can import a list of computers from a specific Active Directory OU or text file, and you can also export the results to CSV file to be viewed in Microsoft Excel. The tool will also show you the Windows product key and product ID for most Windows installations (seems there are some volume license installs where the product key is not stored in the registry in the same way). I spent a considerable amount of time getting the program detection routine to work exactly like Add/Remove Programs in Windows does (which was a lot more complex than I was expecting), so whilst you could actually make a more detailed version that showed system components and drivers etc as well, I chose to make this work how people would expect it to work having used Add/Remove Programs previously. Let me know if you find this application useful or have any feedback/suggestions. EDIT 10/07/2012: Note that I will not be updating this application anymore, as I will be developing a new software and license auditing system some time soon that will essentially replace this. cjwdev, flipping awesome! Ive been looking for something that would do exactly what your audit program does. It is fast too! Thanks so much!. it is really a good program but if u include office it is going to be awesome application. Like it – wish you would include option to uninstall – include PSEXEC – I use a HTA one that works ok but doesn`t always find everything. I don’t specify a port in the program – it is whatever port windows uses for remote registry access. I think if you enable the “File and Printer Sharing” exception in windows firewall then it will work fine.